I have unashamedly pinched the idea of this blog from Kindred of the Quiet Way. Pen was writing about seagulls. I am a big fan of seagulls. 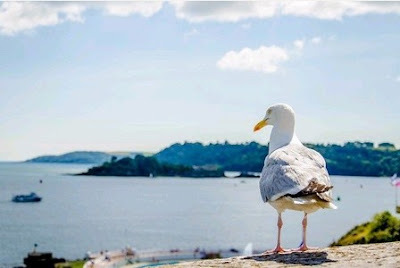 I live in Plymouth and one of the things that first charmed me about the area was the noise of seagulls in the morning – it reminded me of childhood holidays in Torquay. However, few Plymouthians share my enthusiasm for seagulls. Admittedly, it takes a brave person to walk through the centre of Plymouth eating a Scotch Egg. They will dive and take it. They are also making Plymouth’s attempt to promote a pavement coffee culture very difficult – unless you bring your own water pistol to warn the blighters off. The FOWs’ school actually brought a hawk in because of the problems the children were having in the playground. I am not sure this is workable at the Coffee Bean Cafe though. It’s a bit disturbing watching them fight to the death when you are trying to bite the top off a tomato sauce sachet. I once spent an entire lunch break in companionable silence with a seagull who was waiting for the last bit of my tuna roll. In exchange I got to stare at him/her close up. The bird was extraordinarily beautiful. Its white was brilliant white, contrasting with jet black on the wings. After checking that there were no seagull haters about – I was more than happy share lunch. Our local MP instigated a ridiculous debate to have them declared nuisances or something but, in my opinion, they were here first and if they are scavengers, then whose fault is that? If you had a choice between following a trawler in the howling wind for fifty miles or lifting a battered fish from a bin bag, which would you choose? Seagulls are monogamous, can live up to 50 years and have shown tool using capabilities when opening up shells. We mess with their heads and then when they respond accordingly, we think it might be convenient to cull them. Sums up our approach to the environment perfectly don’t cha think? You certainly know about it when they go for you. They really took against my Jack Russell when there were baby seagulls about. Slightly ambivalent, having had a very good toasted sandwich whipped skilfully out of my hand. But, it's true, we put temptation in their way.